This article is about the Nobleman added by Dawnguard. For the Noblemen in the base game, see Nobleman. 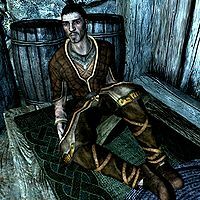 The Nobleman is an Imperial found in Redwater Den in one of the booths set up for enjoying Redwater Skooma. He wears fine clothes and fine boots. If you approach him, he'll say "If my friends could try this Redwater Skooma they might finally understand why I like slumming it with you commoners." You may also hear him comment on the skooma: "Ohhh... that's good stuff. Believe me friend, I've tried it all and this is the best." This page was last modified on 9 January 2013, at 00:12.